Unboxing/Review: ARGMeter for Ophir V1.1 - Sinner's Ophir LPM Upgrade! Finally got some time to post this up, been wanting to do it earlier but couldnt find so much time, This is one helluva LPM so it's worth the share..
To put it in a short succinct statement , It is the most simplicistically advanced LPM setup in the hobby grade category. 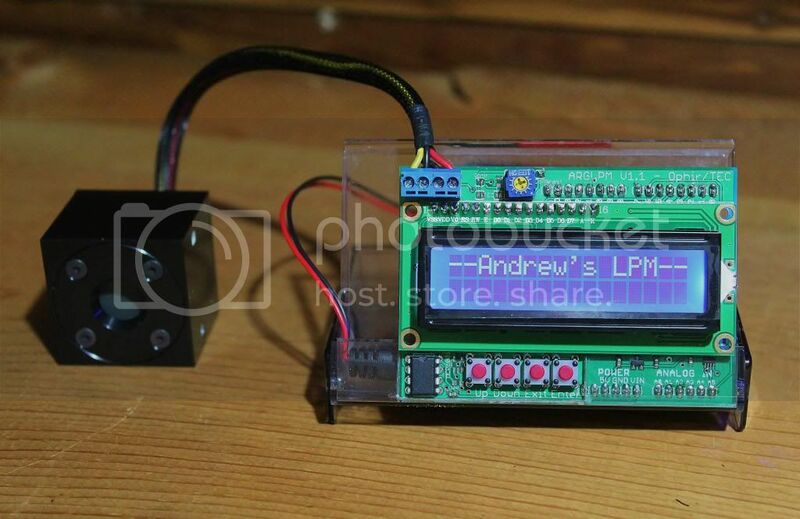 Everything is beyond describe how easier it makes the whole Ophir based LPM with just this ARGMeter for Ophir Add-On. Ophir head requires a complex power input, a +9|GND|-9V in order to power on.. Also needs a voltmeter or Multimeter hooked to the Sensor which gives a reading in mV. The sensors are precalibrated to 1mV=1mW.. If you are using a volmeter panel you will have to use another 6V supply to the voltmeter panel readout! It auto-adjusts the +/-mW (idle) on Ophir so no modifications or coarse adjustments are needed..
- Eliminates the need of two(2x) 9V Batteries +9V|GND|-9V. - Powers on all the components incl. ophir sensor with just One(1x) 9V battery..
- Adds data-logging to your Ophir head via USB (Arduino). - LCD Readout with resolution of 0.1mW - Max/Peak Value and Current Value. You may build your own, Since ARG was generous enough to make his whole project open source. Here's the link if you want to get one..
ARG did a great job in packaging although i asked for the super cheap snail-mail shipping since i had a very limited budget and couldnt spend $30.00 additional to the Add-On price for faster shipping..
As you can see, It is secured with tape on all sides.. So a lots of bubblewrap stuffed inside , Very neat and secure! The ARGMeter comes in Anti-Static bags to prevent from any ESD damage that could happen during the transit , So you dont need to worry about Customs a-holes ruining it since the instructions are clearly written, So no worries there! Now I gathered all the necessary info on Wiring it.. Pretty self explainatory, The best thing about the board is the quality of the components is top-notch. And i simply love the wire connections. Pretty Darn Solid if you ask me, Just the way i wanted it to be! Got my new 9V Battery, Connected the 9V Input lead that was included in the package. Mine come's with Auto-zeroing, That solved the major problem i had which was +4.0mW idle, It wasn't really a problem but now i wont have to subtract that from every reading! Also i can manually Re-Zero with On-board button. Still playing with those to familiarize even further.. The Screen is Liquid Crystal Display (LCD 2.5") has adjustable brigtness levels. Just installed the Arduino drivers and downloaded Peregrine, It is connected on COM3 , Figuring out how to make a graph now.. Will upload some LPM Tests soon. Ok, So i finally configured Peregrine - Universal Datalogging interface on my computer! Straight out of the box, Very simple and lightweight but robust I must say, Great work by Trevor..
Nice detailed pictures! These would look great in a custom case. kind of like this ghetto one? Got to love the ARGMeter! in my opinion the best unit for the Ophir head! LPM Graph and peregrine interface is awesome, I simply love this and jumped on it as soon as ARG offered them..
ultra portable and easy to store! regret, Idk if anyone sells this anymore! Hits actually a hi 8 video camera tape case but you might get lucky at a garage sale or something. I see, That's why it fits perfectly into the case.. I kind of like the ghetto look, its a genius solution, but i want it to be secured in a case.. looks like have to design one myself now! Glad it got there safe and I'm glad you got it all working Let me know if you need any more help with it. Thanks Alex, I figured out most of the stuff.. Getting to learn more related to OpenLPM and Peregrine , But sent you a pm with what i need to know! Nice. I'm looking at getting an Ophir head soon and this looks like a nice match to go with it. I am confused about one thing though. Is the $85 price point you mentioned just for the data logger or is that for the ARGMeter and logger? The link to the page with all the ordering and pricing info in the main ARGMeter thread seems broken. 85$ is the whole setup (minus the Ophir) The LPM comes standard with data logging, as it is a digital LPM. The data logging addon is for analog LPM's. I Wished i could have something like this long ago when i got my ophir, which operates everything with a single 9V and has datalogging in it! I PM'ed alex he said he is working on one prototype, So i waited for months before they were even developed.. and it took another couple of months in transit! I might be selling mine here soon if someone is interested?